The guy in that truck may have been the only person we saw in this little town. Without even realizing it, we re-routed our entire route through Kansas to go along the Oregon Trail. Originally we were going to head down to Kansas City and take I-70 across Kansas, stopping in Goodland to camp tonight. It turned out there was a couple of sights we wanted to see that were along I-36 instead. And so we began our quest to see the world’s biggest ball of twine, a more than 17,000 pound ball of string in what looks like a ghost town, and to see the geographic center of the continental United States, or universe as I prefer to mistakenly call it. 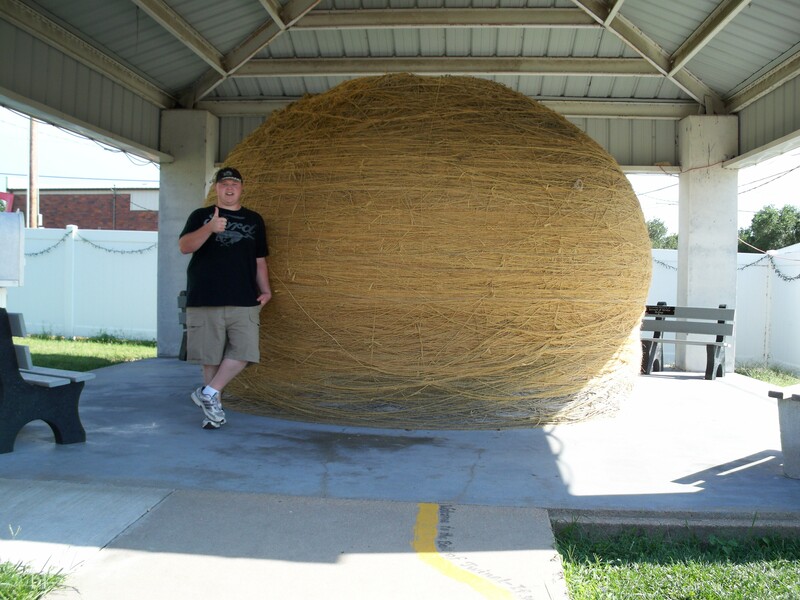 The promised picture of the world’s largest ball of twine, with Cory lending some perspective. 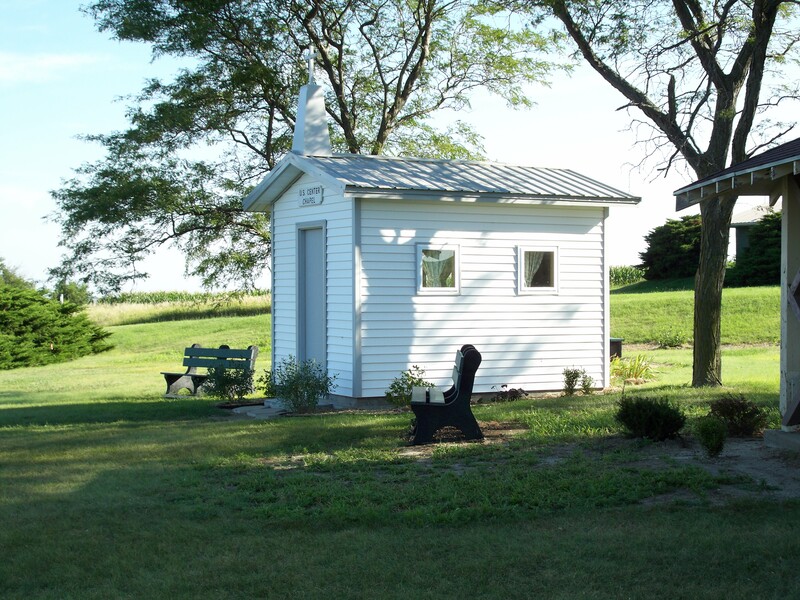 Pictures of the ball of twine will follow, (I forgot to snap a few with my Blackberry) but I did attach a picture of the chapel at the geographic center and of the monument erected there. The third picture you see is the roads we took to get to the monument. Sheila (the GPS) can’t find anything unless we have a specific street address. (If you want to get down to it, she has trouble finding most things, but don’t tell her I said that. But I digress.) We didn’t have an address for the geographic center, so we had to do it old school with the map. With me driving, Amanda studied the atlas and determined a route. We were to get back on I-36 and then take a couple of state roads to Lebanon, Kans. It started getting interesting when the the black top ended. According to the map, the roads were paved. I guess concrete covered in gravel can be considered paved. We follow this road that feels like the driveway on someone’s farm and I start having flashbacks of when I went to monument Rocks near Garden City, Kans. when I was a teenager. Except that time we turned off on a dirt road and even the cows watched us drive by with looks of warning on their sad cow faces. Just when we gave up all hope of ever getting to a paved road again, we saw the road change from the bright white of the concrete to the dull black of pavement in the distance. We ended up right in Lebanon, a couple of miles from the geographic center. After we finished at the center, we drove through Lebanon looking for one of the souvenir shops a sign at the monument promised. We didn’t find anything. And by anything, I mean not a soul. Or an open shop. I shot a short, quick video of the “business district” of Lebanon that I’ll post tomorrow when I get some Wi-Fi. 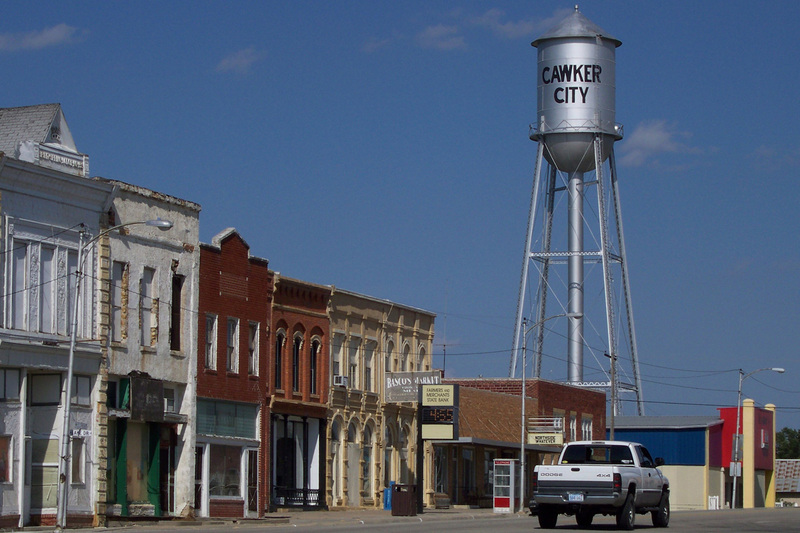 We are two for two in abandoned towns today; Cawker City, home of the ball of twine, looked abandoned as well. Those pictures will be posted tomorrow as well. Now we’re on our way to a camp site in Colorado. Hopefully we’ll pass another Wal-mart sometime soon, because my camera has chosen the most inopportune moment to give up the ghost. This entry was posted in Gypsy Trip, Kansas, Oregon Trail and tagged Ball of Twine, Geographic Center, Gypsy Trip, Kansas, Oregon Trail by Cassie. Bookmark the permalink.